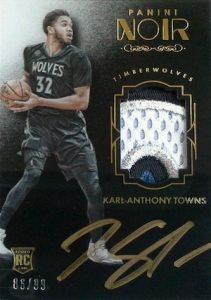 Following up the debut last year, 2015-16 Panini Noir Basketball looks to continue the same contrasting focus that made it a unique option for high-end collectors. Hobby boxes yield seven total hits. Offering dueling designs, base Veterans and Rookies come in both Color and Black-and-White form, each with a different player image. 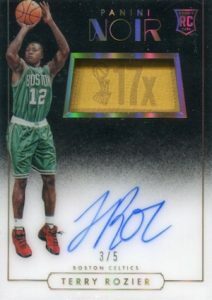 There are also Platinum (#/10) parallels for the B/W cards and Gold (#/10) parallels for the Color. 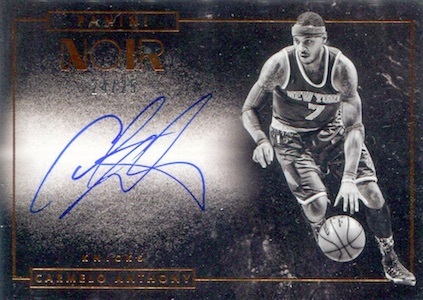 Signed options in 2015-16 Panini Noir Basketball include Spotlight Signatures with a large signing area, and auto relics with Autographed Prime and Rookie Championship Dreams Tags Autographs. 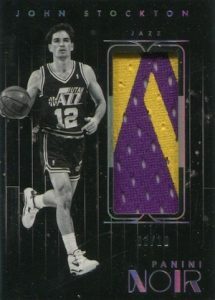 The latter includes the Larry O'Brien Trophy patch from the back of the jersey. This marks the first time that the NBA championship tags are featured. 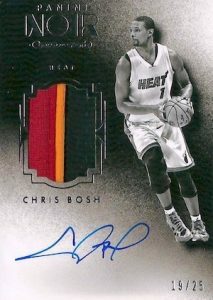 Continuing the design contrasts, the main Autographs are found as either Black and White or Color versions. Among the relics are Jumbo Material Prime cards with an oversized patch piece, as well as Acetate Noir Prime and Rookie Noir Prime. 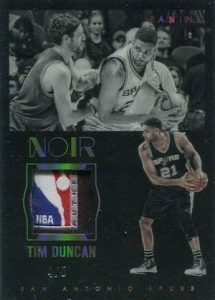 The memorabilia cards also come as either Patch or Tag parallels. 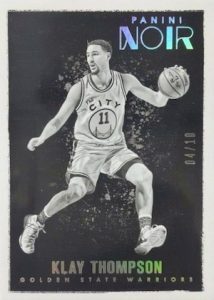 Each of the cards in 2015-16 Panini Noir Basketball are limited to 99 copies or less and the checklist includes former greats alongside top rookies and current stars. 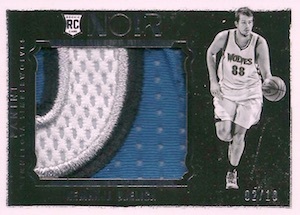 Noir Basketball 2015-16 DEMARCUS COUSINS 9 10 PRIME 4 COLOR PATCH. RARE!!! 200 cards. Serial numbered #/99. 60 cards. Serial numbered #/99. See specific parallel print runs with the full spreadsheet. All subjects not included in the parallel. See specific parallel print runs with the full spreadsheet.